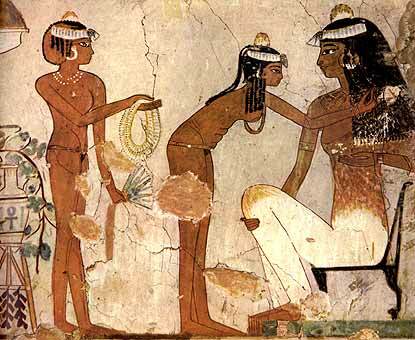 Djeserkaresoneb along with his wife and son stand before offerings which are then offered to the gods Amen, Harmachis, Osiris and Hathor. Below this scene butchers are shown cutting up the oxen which is then used for the funeral feast. An adjacent wall shows Djeserkaresoneb is shown amongst various farming scenes - a farmer measures a field with a measuring rope, crops are harvested, the grain winnowed, ploughing scenes - the farmers are also shown briniging offerings to Djeserkaresoneb (Djeserkaresoneb himself makes an offering to the serpent Rennut - the goddess of the harvest). 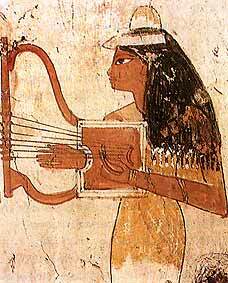 Two scenes from the tomb - a musician plays her harp, and two waitresses attend a guest at the feast.